This sensor uses a non-modulated laser receiver. Please use it in a place where there is no light in the room. Sunlight or other lamps may interfere. It is recommended to use it in a dark environment. Output high level when there is laser irradiation. Output low level when no laser irradiation. With fixed bolt hole for easy installation. Mini PCB board size: 1.52*2.22cm. Low-power, wide-angle and long distance reception. 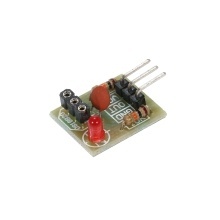 This sensor uses a non-modulated laser receiver, use it in a dark environment.